Cartier watches are fine jewelry that are made out of only the best materials. Cartier uses several techniques to identify and mark its watches so that an authentic Cartier watch can be told apart from a fake one. The surest way to know you have purchased an authentic Cartier watch is to purchase from a certified Cartier dealer. 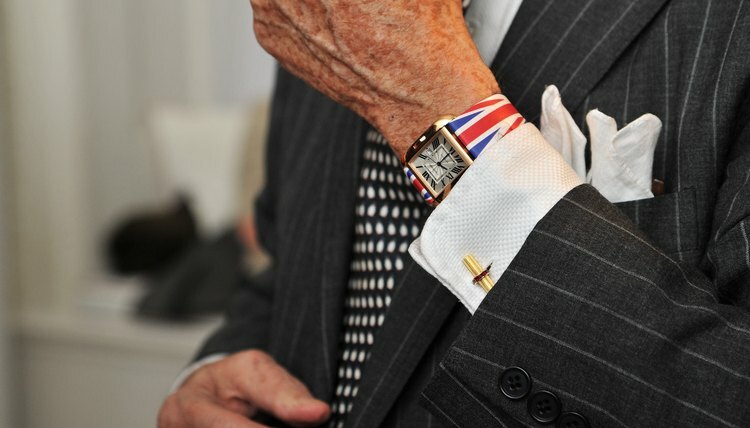 Look for the word "Cartier"
Look over the watch for the word "Cartier" generally printed on the face of the watch. Many fakes misspell the word, and it is clear you have a fake if "Cartier" is written wrong. Put a few drops of water on the face of the watch and see if it smears or beads off. If the water smears, it is likely you have a fake. If the water beads on the surface, this is an indication of sapphire quality glass that is used to make Cartier watches. Look for the Cartier logo on the watch, which is two letter C's facing back to back. The logo can be found on the dial of the watch, the back or the buckle. How to Tell If a $2 Bill Is Fake? Check the side of the face of the watch for an engraved serial number. Cartier watches are all professionally engraved with a serial number on the side. If the engraving looks poorly done, you probably have a fake. Look over the crown of the watch and see if there is a gemstone set into it. A gemstone glued on top instead of set into the crown is a clear indication that the watch is not authentic. Check the overall appearance of the watch. If it appears scratched or chipped, the watch is probably a fake. Cartier uses very high-quality materials that are difficult to damage with normal use. Cartier watches are made of the finest materials and will be more substantial and weigh more because of this. You can bring your watch to any certified Cartier dealer to have it checked professionally for authenticity. A good Cartier watch starts at about $3,000. If you are being offered a Cartier watch for much less, it is either fake or stolen. Melissa Nykorchuk has been writing professionally since 2002. She has contributed to various online publications and obtained a Bachelor of Arts in English from the Massachusetts College of Liberal Arts. Nykorchuk, Melissa. "How to Tell an Authentic Cartier Watch." , https://legalbeagle.com/6360654-tell-authentic-cartier-watch.html. 17 December 2018.